When it comes to luxury candles the market is full of options. We have lots of sniffing around to do if we are to find the candle that perfectly fits the room and adds that extra spice of atmosphere. I’ve had been perusing candles for some weeks before making the appropriate choice. I had thoroughly enjoyed my “John Galliano” candle by “Diptyque” over the winter months but was looking for something a little sweeter this time. I picked up “Jaisalmer” by Comme des Garcons @ the Goodhood Store in Shoreditch, which is packed full of relatively mediocre but hugely overpriced clothing. I find the lifestyle section much better though and the selection of pots, trinkets and beauty products is far more interesting than the clothing. 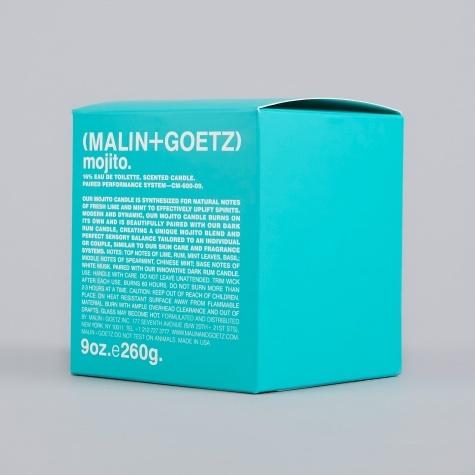 I was then shown the “Malin + Goetz” candles which priced at £38 and with a life of 60 hours, you are bound to get more for your money. However I was put off by the branding, separately they look great but all together they felt very ikea and a bit kiddy, which is not what I would hope from an expensive candle that might help me to feel at least a bit adult for two seconds. I was also not so excited by the fragrances as I feel inundated by neroli, geranium and vetiver from just about every shop in shoreditch at the moment. These trends just get a bit boring two years down the line and there are other brands doing these fragrances who I feel match the branding to the scent more successfully. Furthermore, the thought of my room smelling of Mojito really is not my idea of luxury. Finally I went to to the Comme des Garcons “Incense” Candles. I was initially staying away from these as I already have a perfume from that range and didn’t want to get two of the same thing. However at closer inspection the scent from the candles is slightly different than that the perfumes – I presume because they are in a different medium. The wax tends to cream things up and take the edge out of some of the spicier notes. I was smelling back and forth until my nostrils couldn’t cope any further. Priced at £32 with a 30 hour lifespan these candles weren’t the best value for money but they were also not the worst. I went with Jaisalmer because I almost bought the perfume but didn’t because it was a bit too hippy. However in the candle format it has more vanilla notes and you are left with a curious sweet spice that is a wonderful to many a room. It’s particularly great for my bedroom as it is neither too musky or too floral. There is no gender to the perfume which I like as I like people to walk into my room with an untainted mind. The branding on the shelf is not wonderful, which was something else that put me off slightly. However, the scent was what pulled through and actually sat in my room it does look understated and slick. Jaisalmer by “Comme des Garcons” is a stunning fragrance and I would recommend you all give it a good sniff.